As part of the Inflight Food Trip documentary I’ve been working on, Swiss invited me to participate in a first class flight attendant training session in Zurich. I would come along and watch the crew receive training all while getting to sit in a cabin mock-up and enjoy a six-course first class tasting experience. Of course, I said yes, and I was so excited about it. 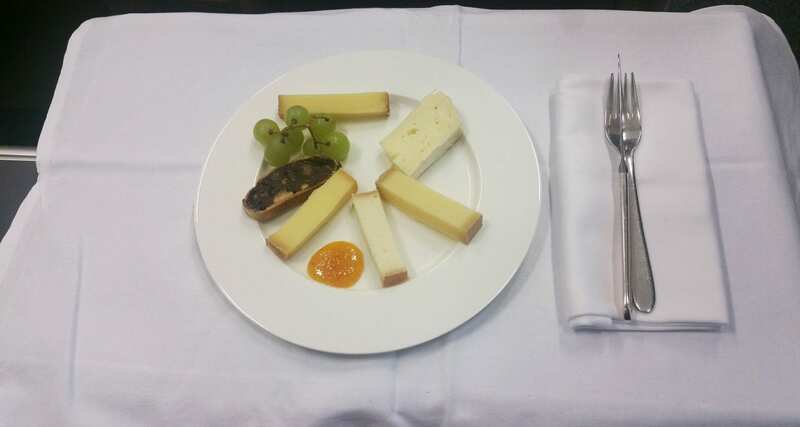 I’ve flown first class only once, and that was with Singapore Airlines, and Swiss are known to have a fantastic gastronomy experience in first. So sit back and relax and enjoy the first class ride. Swiss gave us full access to film as much as we wanted at the Swiss Aviation Academy located near Zurich airport. 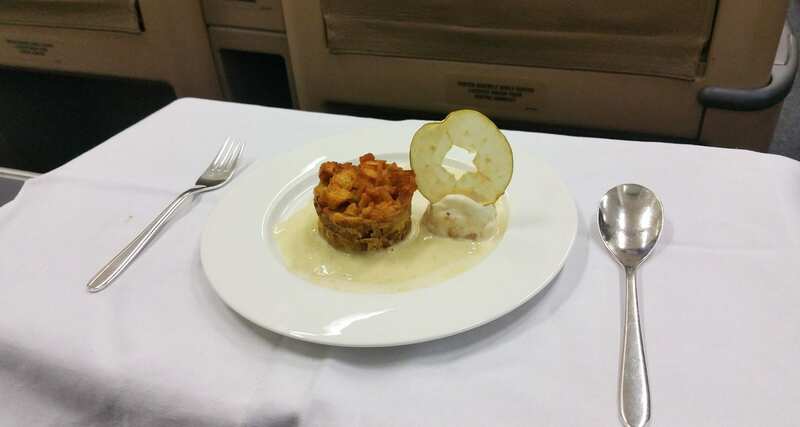 The trainees were existing cabin crew who applied to work in the airline’s first class cabin, with training covering many subjects, so let’s begin by taking a look at the inflight menu. The menu that I sampled was created in co-operation with Sven Wassmer from Restaurant Silver from the canton of Grisons in Switzerland. If you would like to take a look at the menu click here. 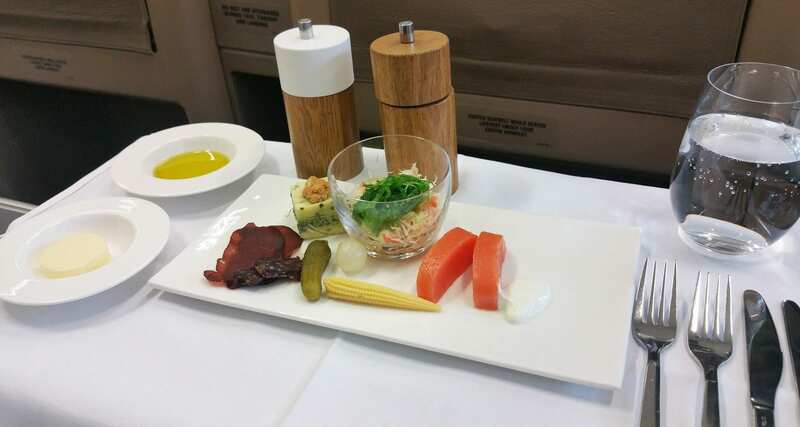 First up the cabin crew asked what I would like to eat for the starter, there was so much choice that I asked her to surprise me with a tasting plate of items that she loved. And so I received this beautiful looking platter below. Tastes as good as it looks: Fillet of Balik salmon, Crabmeat with ponzu sauce, Black garlic purée, seaweed salad with sesame, A selection of meat specialities from the canton of Grisons Carnaminz, Surselva dried meat, venison Salsiz and Mostbröckli and a Potato and spinach terrine with Grisons nut pie crumble. Simply delicious! Fresh: Seasonal salad served with pumpkin and porcini mushrooms. Seriously good. Don’t you just love the Salt and Pepper shakers too? A bright, sharp-tasting salad with just the right amount of dressing. Delicious. Then it was time for soup. 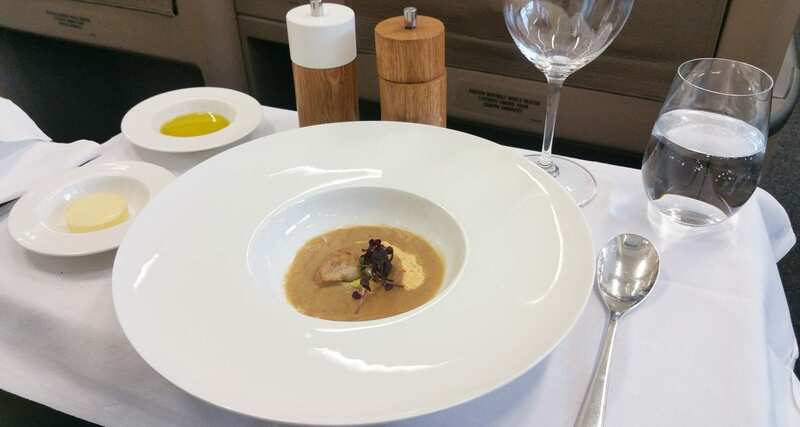 Soup: Chestnut and apple soup with savoy cabbage and pumpkin sour cream and smoked quail breast. The soup was creamy and full of flavour, I enjoyed the various tastes that came through. It was the perfect portion size too, not too little but just enough. Beef tenderloin with jus Capuns and carrot purée with chilli. Braised veal cheek with truffle sauce Smoked potatoes, kale purée, caramelised onion. Marinated cod Pearl barley risotto, fresh herb salad. Mushroom stroganoff, Baked rösti, peppers, paprika, parsley. 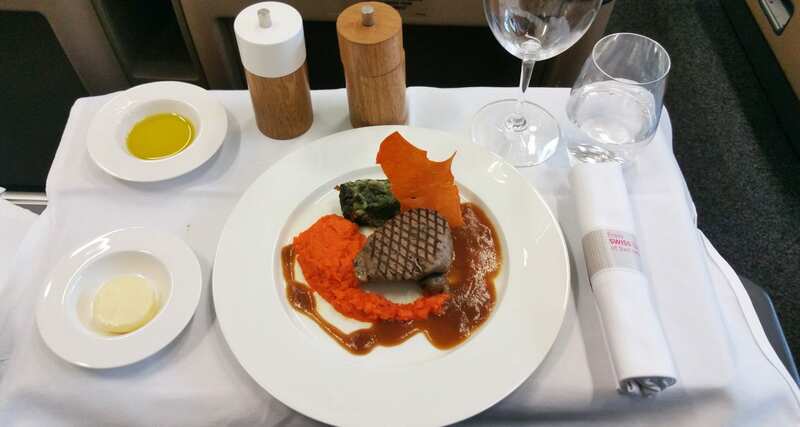 Undecided, I asked the crew member for her recommendation, and she advised that I must try the Beef Tenderloin, which I did…I trusted her entirely she was a total foodie and lead the way for me on the gastronomy tour of Swiss first class. Main Meal: Beef tenderloin with jus, Capuns and carrot purée with chilli. The meal was plated beautifully by the crew (check the gallery out below to see how the crew are shown to do this) and looked very appealing, something akin to a fine dining experience at an upscale restaurant. The beef was delicious, and the red wine jus complimented the meat. Capuns (the green item next to the carrot purée) is a type of dumpling and come from the canton of Graubünden in Switzerland and made from Spätzle dough (a kind of pasta, and if you ever see it on a menu somewhere try some it’s delicious). They then add pieces of dried meat, and it’s rolled in a chard leaf. Finally, it’s boiled in gravy and covered in grated cheese. All in all this dish was mouthwatering and just incredible. There are still two courses to go….! Next up was the cheese plate. Swiss Cheese: Delicious cheese from the canton of Grisons. Starting to get full now, but also know that dessert is literally around the corner. It was a lovely plate of cheese with various tastes, my favourite part of the dish was the very spicy sauce that was served alongside the cheese. Finally, it was time for dessert, and I settled on the Apple brioche bread and butter pudding with caramel Calvados custard, macadamia nut ice cream. Dessert: It was heavenly, the brioche bread was light and fluffy, and the custard and ice cream made it very moreish, it wasn’t hard to finish this dessert at all. Simply divine. I enjoyed my faux first-class experience on the ground; it was great to see the crew learning through the training. 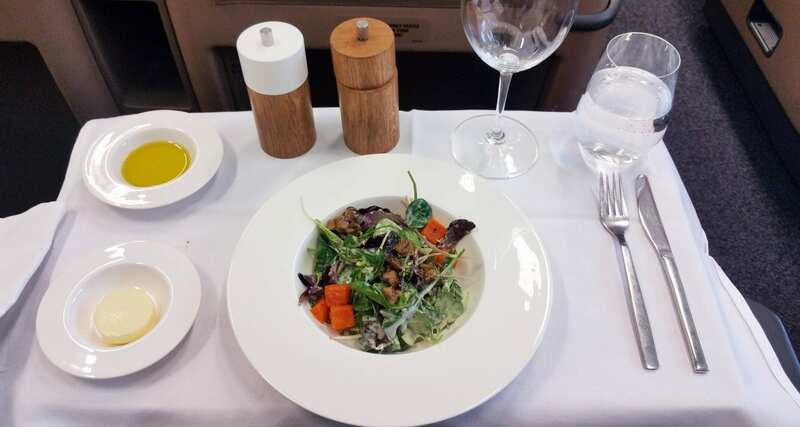 Everyone served each other and then sat down to eat the meals of their choice, an excellent way for them to not only learn but also experience what first-class customers do. It’s something the crew get to do a lot; I guess it’s difficult to explain various flavours and meals to customers without having experienced them yourself. Check out the below gallery which shows you some behind the scenes photos from the day. A HUGE thanks to Swiss for hosting me, I loved every minute of it and if you ever need volunteers in the future feel free to call me!